What happens to a world of yarn dinosaurs when an evil, yarn magician-turtle kidnaps all the yarn dinosaurs, turning them into yarn bundles and scattering them across various worlds? Well, Yoshi's Woolly World aims to explore this concept and more. 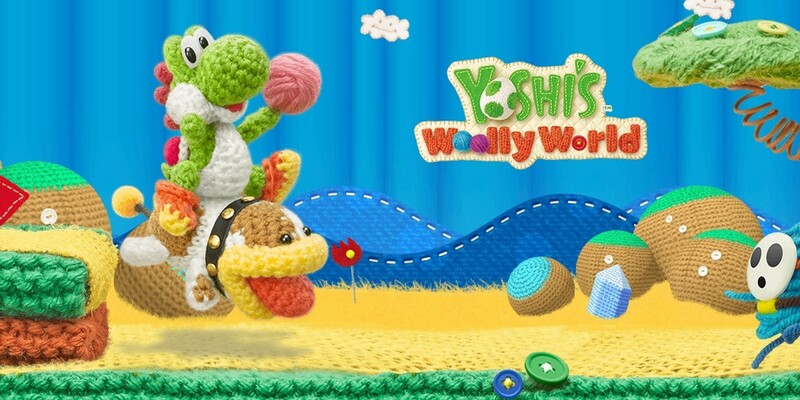 As a Yoshi made out of yarn, you travel from world-to-world collecting the yarn bundles in order to craft new Yoshi designs and defeat the evil magikoopa Kamek. If you're searching for a fun, new game to play on your Wii U, this game is definitely for you. Here's why. Yoshi's Woolly World plays along the same vein of the Super Mario games. You travel from level to level within themed worlds, using similar controls to collect yarn bundles and defeat enemies. The only differences are the various power-ups and abilities the woolly Yoshis possess. Yoshi can obviously eat things like regular Yoshi can, but woolly Yoshi can also turn anything eaten into yarn balls, which trail behind woolly Yoshi. These come in handy to throw at things either to create wool platforms or objects, collect beads and yarn bundles, or to destroy enemies. Basically, this game is an adorable spin on the well-known Mario world, which brings me to my next point. The game is pretty easy to play. Sure, there are moments where you have to figure out where things are. There are moments where you miss one of the collectibles and have to replay the entire level in order to find it. But for the most part, the game is easy to play and understand. As much as I love playing video games, sometimes I can be really horrible at them. Mario games fall into the category of "games Jaime likes to stupidly mess up playing." Even I can play this game with some help from the co-op gameplay. However, the easiness of the game doesn't lower the game's quality. It is still enjoyable, and it's received fairly decent review scores, the lowest being 6/10. It was also voted into Nintendo's top ten for Fan Favorites of 2015. That being said, the game is just fun. As one of the many different woolly Yoshis, you travel from world to world experiencing all types of interesting possibilities for the Yoshi to transform into: motorcycle Yoshi, rock-digging Yoshi, Umbrella Yoshi, etc. If you play the co-op game play, you're able to eat your partner, even turning them into a yarn ball to throw. This can be quite the hilarious and interesting option. Even the enemies are made of wool, which adds to the color schemes of the yarn balls and bundles. You can use the amiibos to unlock options available only in co-op to be used during single game play or unlock special wool Yoshi designs like Mario or Donkey Kong. The concept of the game is just fun and hilarious. The entire game is just one big ball of cuteness. Everything from the various Yoshis to the backgrounds to the game play and sounds are just adorable. As someone who has always preferred playing as Yoshi in Mario Kart or cried when Yoshi ran away during Super Mario levels, I didn't think Yoshi could get any cuter than the little, green dinosaur that he is. But I was wrong. Woolly Yoshi is so much more adorable. I've probably "died" on the game more times from being distracted by the overwhelming sense of adorableness than anything else. The combination of fun, easiness, and yarn makes this game too cute to handle. I love it. Seriously though, the woolly Yoshis concept is just fabulous. You play as a dinosaur made out of yarn, which throws yarn balls at things to make them explode or craft wool items to help you along. You're saving the woolly world from an evil magician, who stole the Yoshis and split them into yarn bundles. How could this not be a fantastic game? Plus, you can even get a woolly Yoshi amiibo made of yarn. Yes, it's actual yarn! This is just ridiculously fantastic. Yoshi's Woolly World might seem like a strange concept for a game. It might even seem like it's geared toward little kids. But let me tell you, if you like the Mario games, Yoshi, or a little bit of fun and yarn, this game is definitely worth checking out. Plus, you get to play as a dinosaur made out of yarn. If you're still not convinced, check out this cute trailer, which shows you all the features and more. Have you played Yoshi's Woolly World? What did you think? What other Mario-related games do you love?